No SST20 came simply to late for the game. It definitely seems worth trying a swap, given the low cost a triple board with SST-20’s can be had for. I’m hoping to compare it LH351D’s and SST-20’s and decide which I like better. Hi I would like to sign up for the buy if I still can. I’m in for an XP-L HI and a Samsung LHD! I think the SST-20 is a great option for a future update. I will definitely put SST-20s in one of mine. It wasn’t yet known to this community when voting on the emitters for the FW3A took place, and trying to add an additional option now would only delay production. The SST-20s 4000k are easier to get than the LH351Ds. So unless the LH351Ds are of a good chromacity bin, going with SST-20s would be great for even better color rendition, and more throw. Why would they give more throw? Much smaller die area than the LH351D, and even optical emission area is smaller than the XP-L HI. So they are also less bright? So, with the current Q2 tint bin, the LH351D is 16,5% more efficient. With the R2 tint bin, the LH351D is 23,5% more efficient than the SST-20. So, yeah, less overall light will be emitted. However, since this is an EDC light, the LH351D will be much more floody, and will require higher power levels to be usable outdoors. The SST-20 would be a better overall choice in terms of usability. That all sounds good on paper but my Ti/Cu scratch built EDC uses a Carclo quad optic with Samsung LH351D 80 CRI 5000K (U6 power bin) emitters and works quite nicely outdoors in the big wide open area’s we have here. It’s certainly no thrower, but it’s not lacking either, even run on an 18500 cell. Beam profile is sweet, sans the Cree artifacts, with a defined fat hot spot that I’ve found very much to my liking. At what level are you running the light ? I like the LH351D because it gives nice NW color while still giving similar output to xpl or xml2. So the SST-20 is a bit more similar in die size and output to the XP-G3 or 219C? my Ti/Cu scratch built EDC uses a Carclo quad optic with Samsung LH351D 80 CRI 5000K (U6 power bin) emitters and works quite nicely … Beam profile is sweet, sans the Cree artifacts, with a defined fat hot spot that I’ve found very much to my liking. From what I hear, it’s not always max. It’s frequently at lower levels, especially candle mode. A lot of people care about the tint in low modes, not just turbo. And unfortunately, a lot of emitters have their worst tints at low power levels. The color temperature and tint can shift quite a bit between a low mode and a high mode. That’s why I didn’t like the SST-20 4000K 95CRI emitters I tried. The tint was okay on high modes, but I almost never use those… and at the lower levels I actually use, it was a long way from white. I have my Ti/Cu DBC-04 set up to always start at the lowest level, I use it according to the need. Very seldom use Max, but sometimes. Max is around 3500 lumens on the 18500. Level 1 or 2 get’s used in the house a lot, outside I seem to go straight to 4 or 5 out of 7. The SST-20s I got from Kaidomain (FB4 tint bin) are kind of yellow at low power and not really my favorite tint at any power level, but I just got done reviewing a light that came with an XP-G2 that I think was a 5S tint bin so I’ll take it. I’d put more emphasis on getting FA4 or FA1 tint if I was buying a bunch of SST-20s than I would on flux bin. 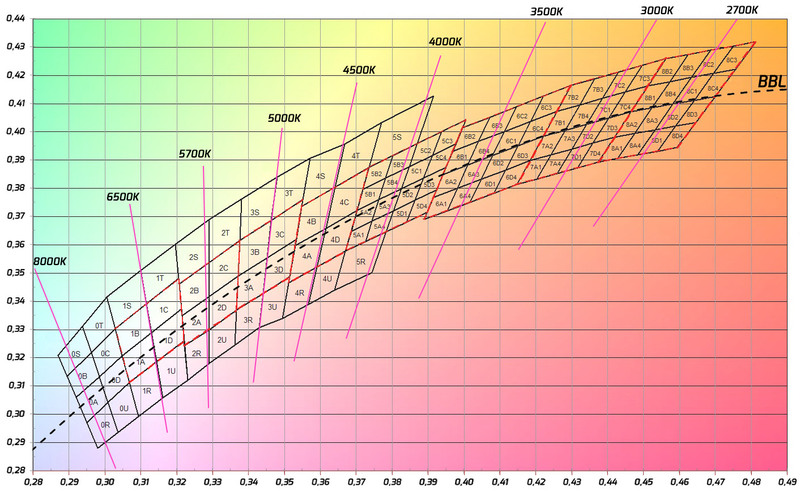 I have a suspicion that sometimes non-green tint and the highest flux bins are incompatible, because adding more 555nm has a strong tendency to increase lm/W, being the peak of human visual sensitivity. The peak current of FW3A won’t be 1.05A per emitter but significantly more. At higher currents the efficiency gap will be larger when comparing both LEDs at the same current. Furthermore SST-20 actually has lower Vf than LH351D so it will draw more current. This will make the efficiency gap yet another bit larger, but it will reduce the brightness gap slightly. I’m am interested in one, please add me to the list. The peak current of FW3A won’t be 1.05A per emitter but significantly more. At higher currents the efficiency gap will be larger when comparing both LEDs at the same current. Furthermore SST-20 actually has lower Vf than LH351D so it will draw more current. This will make the efficiency gap yet another bit larger, but it will reduce the brightness gap slightly. vF a lot closer than you think when comparing both in high CRI. The LH351D has much higher vF in the 70CRI model but the 90CRI is a different beast. I would like one, in XPL-HI if I have a choice. If no choice, I’ll take whatever is made. Interested. please add me. Thank you. Interested xpl hi. Thank you all for your efforts. I’m very interested in this! Hello, I requested to be on the list for one on 1/7/19 but do not see my name. I just want to make sure I am in with this awesome group buy.